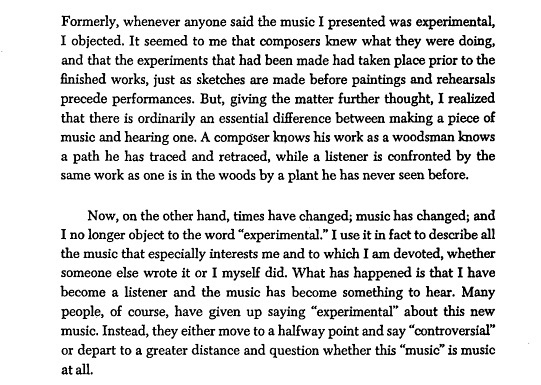 I was exploring John Cage's minimalistic music earlier today - like I wrote earlier, some days you need quiet. And in the spaces between the quiet, you need some notes. Also, listen to this lovely meditative piece, composed for 5 voices, which is one of his many Number pieces, a body of late compositions by John Cage where "each piece is named after the number of performers involved: for instance, Seven is a piece for seven performers, One9 (read "One Nine") is the ninth work for one performer, and 1O1 is a piece for an orchestra of 101 musicians." It is only this year that I have started exploring the so-called "minimalistic" music of such 20th century music composers as John Cage, Arvo Pärt, and La Monte Young. Listen to this composition by Arvo Pärt, for example. 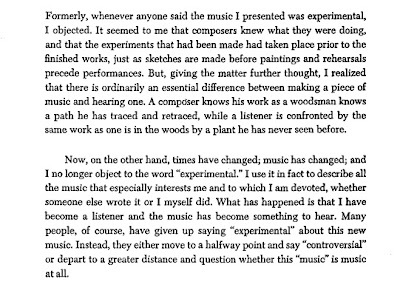 Though I should admit I have not reached the point where the music is stripped so bare that all that is left is the silence, as in John Cage's 4'33". Ancient proverbs tell us that "Silence is Golden" and Rumi may have said that "Silence is the language of god, all else is poor translation.” but John Cage gives us a very different interpretation of silence in 4'33".